The cylindrical design for the lighting provides one more option for the desktop lighting. It made completely with bamboo for the shelter. And the inner shelter comes with Japan style to enhance the mild style for the in door requirements. It can use on any room of the home. Or the study room for the heavy thinking in the night time. 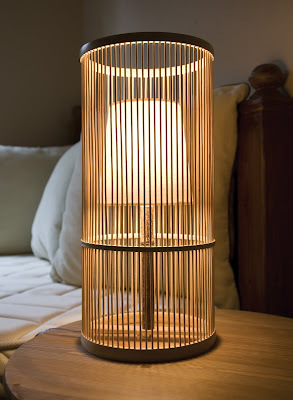 The design is full of the environmental feeling especially use the bamboo wires to construct the lighting shelter, it’s also the keep it as natural as without using other chemicals to maintain the natural smell of the bamboo. For the DIY user, it can paint any color they love or other graphic pattern there.